Not even the Soup Nazi can escape the tax man. Soupman, made famous by a beloved Seinfeld episode, filed for bankruptcy this week. The Chapter 11 filing comes less than a month after Soupman's chief financial officer was arrested and charged with tax evasion. The bankruptcy was caused by a "combination of legal liabilities and recent company developments," Soupman CEO Jamie Karson said in a statement. Soupman's soups are made from the recipes of Al Yeganeh, a chef who inspired the angry Seinfeld character known to bark: "No soup for you!" to customers who didn't know what to order when it was their turn at the counter. But customers don't need to worry about going soup-less. 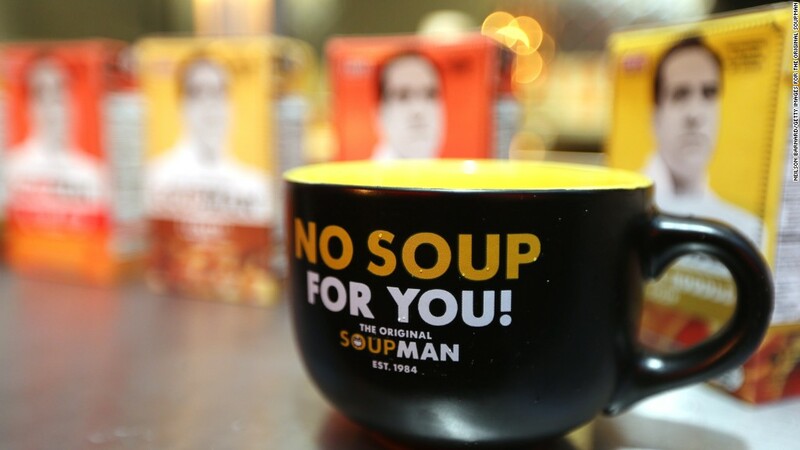 Soupman said its soups will remain on grocery store shelves because the company secured $2 million in financing to keep it afloat during the bankruptcy process. "We anticipate that there will be no disruption in the quality of our product or service," Karson said. Staten Island-based Soupman owes up to 100 creditors between $10 million and $50 million, according to the bankruptcy filing in Delaware. The company listed $1 million to $10 million of assets. Last month, Robert Bertrand, Soupman's chief financial officer, was arrested for allegedly failing to pay nearly $600,000 worth of Medicare, Social Security and federal income taxes. Bertrand, who denied wrongdoing and pled not guilty, also paid workers unreported cash and stock awards worth $2.8 million between 2010 and 2014, according to the indictment. While the Soup Nazi was made famous by the 1995 Seinfeld episode, Yeganeh opened his first Manhattan store nearly a decade earlier in 1984. Today, the company sells soup to grocery chains and also at its New York-area restaurants under the brand name "Original Soupman."